Look for the Proudly Wisconsin Badge when shopping for cheese. Any brand of Wisconsin Parmesan can be used in this recipe. Whisk sour cream and buttermilk until smooth. Stir in the parmesan, chives, Worcestershire sauce, garlic and salt. Season with pepper to taste. 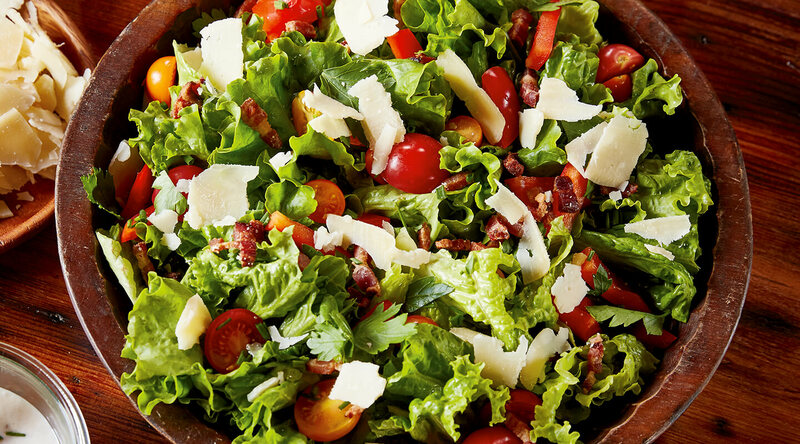 Toss lettuce, tomatoes, red bell peppers, green onions, bacon, parsley and chives in large salad bowl. Drizzle with dressing. Garnish with shaved parmesan. Dressing will keep in an airtight container for up to three days. To make this recipe low carb, use 2 tablespoons of dressing and 1/2 cup cherry tomatoes making total carbs per serving 8g. Wisconsin leads the production of award-winning parmesan cheese in the U.S. Its buttery, sweet, nutty flavor intensifies with age. Grate it, shave it or slice it - serve parmesan on top of light soups or in hearty main dishes and everything between.